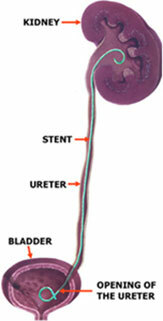 A thin, hollow tube placed inside the ureter during surgery to ensure drainage of urine from the kidney into the bladder. J shaped curls at both ends hold the tube in place and prevent migration, hence the description "Double J stent". It allows the kidney to drain urine by temporarily relieving any blockage, or to assist the kidney in draining stone fragments freely into the bladder. The lower curl can irritate or “tickle” the bladder and make you feel the need to go to the toilet all the time to empty your bladder (frequency and urgency). It can also cause moderate discomfort in the kidney region on urination, and at times you may notice blood in the urine. Some patients have no bother and others are significantly bothered by the stent. None of these symptoms are harmful and your body gets used to the stent over time. Simple analgesics may be helpful in controlling the discomfort (Panadol or Nurofen). All symptoms resolve after stent removal once definitive treatment is completed. Stents are used in temporary situations and must be removed from the body. Stents must be removed within six (6) months from the date of insertion. In most cases they will be removed well before that time. It is important that you remember you have a stent and not forget about it as it can cause stones to form, infections and even kidney damage.